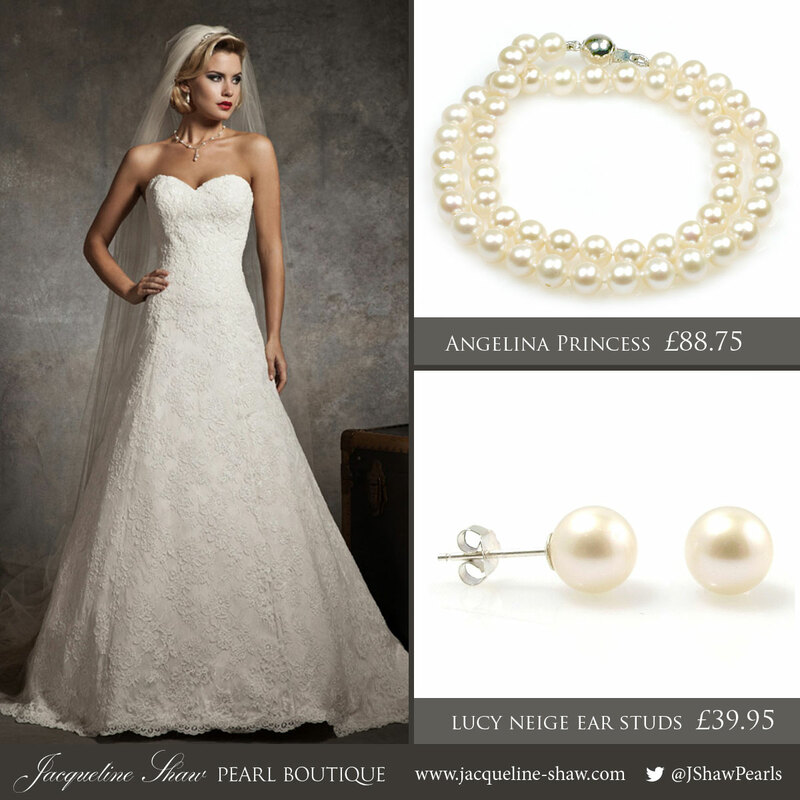 For the lovely brides who have opted for pearls for their Big Day, we have put together a few inspirations and picked our favourite Jacqueline Shaw wedding pearls for different wedding dress neckline and styles. Hope that this is useful for you! And of course, if you would like some more recommendations, you should get in touch by email or tweet @JShawPearls, we would be happy to give you personalised recommendations! 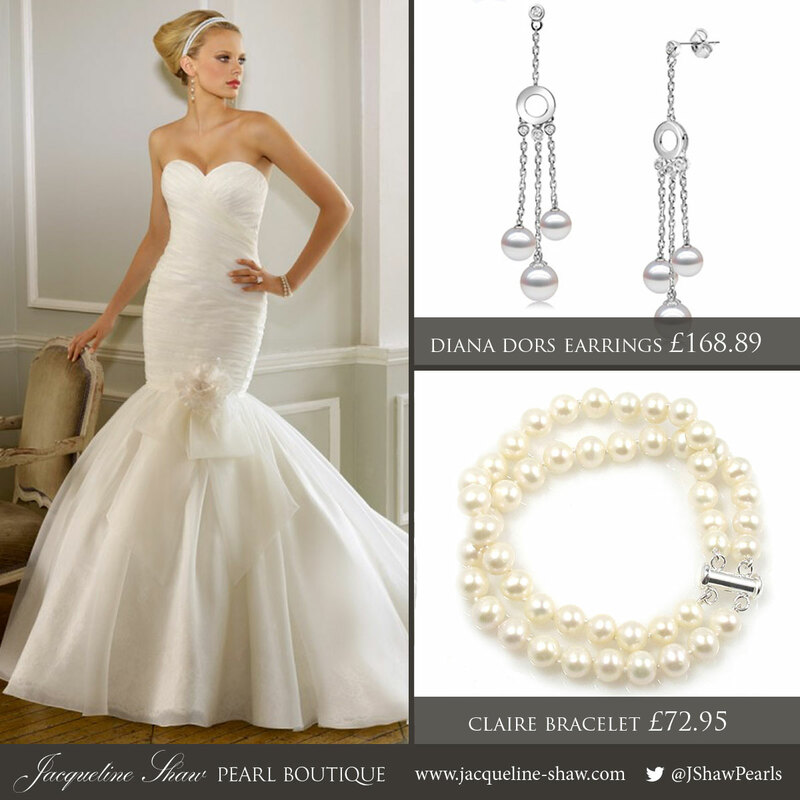 For this classy yet seductive wedding dress design, we've picked NO necklace, but just a pair of statement, dangling earrings, the Diana Dors pearl earrings. Add a double strand pearl bracelet Claire, the look is coplete, and less is more. But of course, if you prefer, the Sweet Heart neckline is also perfect for a big statement necklace, so swop the long earrings with a pair of shorter ones or a pair of studs, then you can wear a statement necklace like the next style. This wedding dress is incredibly simple and hence it's unique charm. Although the same Sweet Heart neckline as the previous style, this dress opts for a traditional A Line tail with Georgette fabric overlay which is naturally 'floaty'. 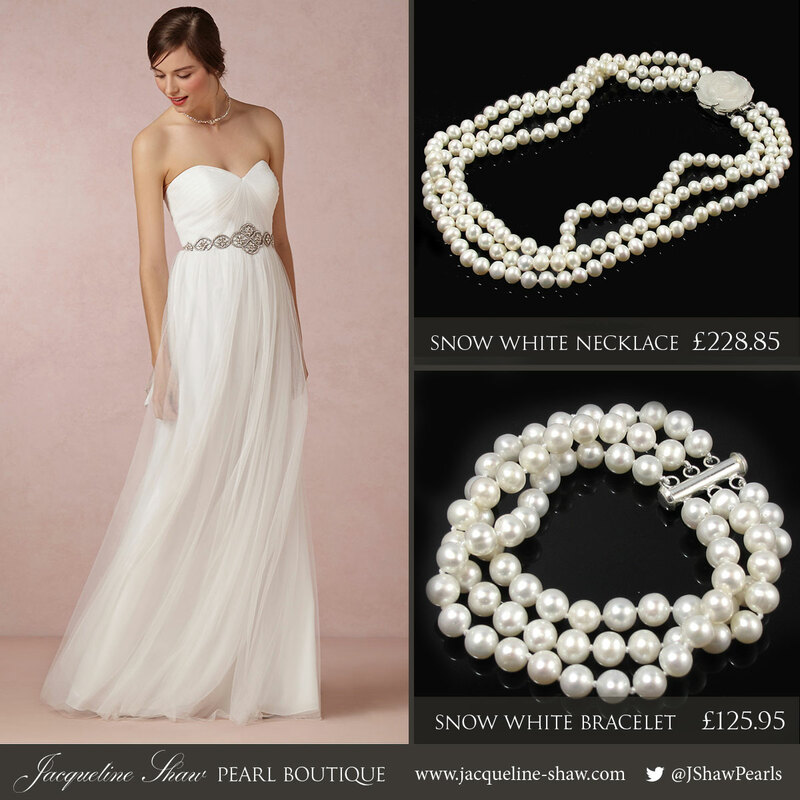 The wedding pearls we choose to balance this lovely design are the statement three strand wedding pearls set: the gorgeous Snow White. The Snow White pearl wedding set uses AAA rated freshwater pearls, knotted three strand on silk thread with metal wire enhancers at both ends of each strand. The necklace features a hand-carved white jade rose clasp which adds a beautiful finishing touch to the piece. You can wear it with the clasp on the front-side for a different look. For the earrings, a pair of simple, perfectly round 9mm pearl ear studs is our pick - the beautiful Lucy Royale. For an off the shoulder wedding dress, we pick the Viona three strand wedding pearl necklace that wears tightly around the neck à la Grace Kelly, who also loved off the shoulder gowns. The strands can be twisted tightly or loosely as you like to fit comfortably around your neck. 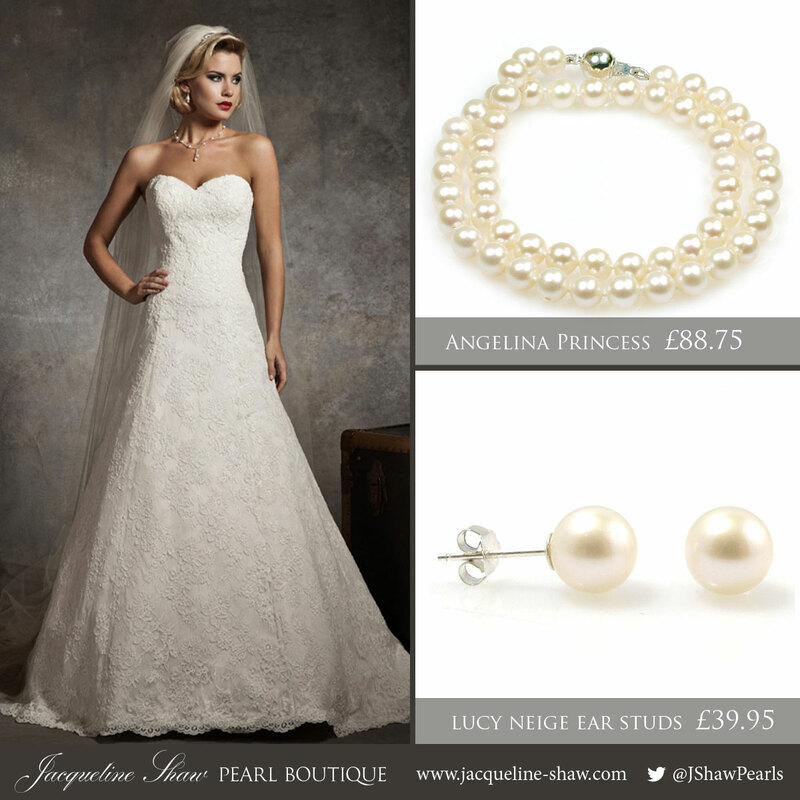 For ear studs, a simple pair of 7.5mm pearl studs, the Lucy Princess, would finish the look beautifully. 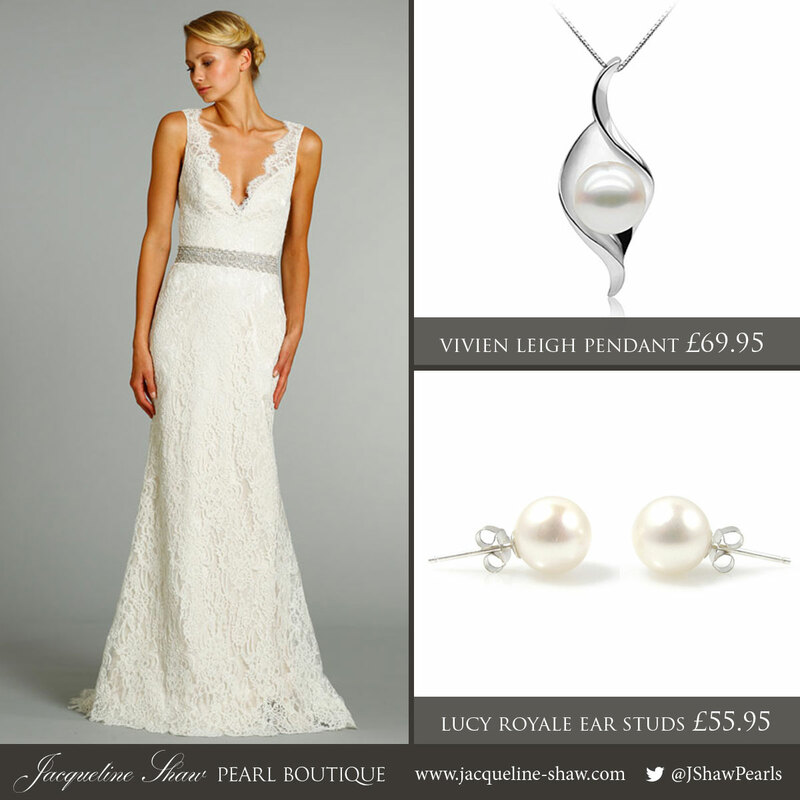 For this V Neck wedding dress with a lace tail, we pick the Vivien Leigh pearl pendant whose shape goes in harmony with the dress silhouette. The single pearl on sterling silver base with Rhodium finish accents the whole look without being too dominant, leaving the whole style in balance. For ear studs, the Lucy Princess feature the same perfectly round pearls as the one in Vivien Leigh, making it a perfect set. 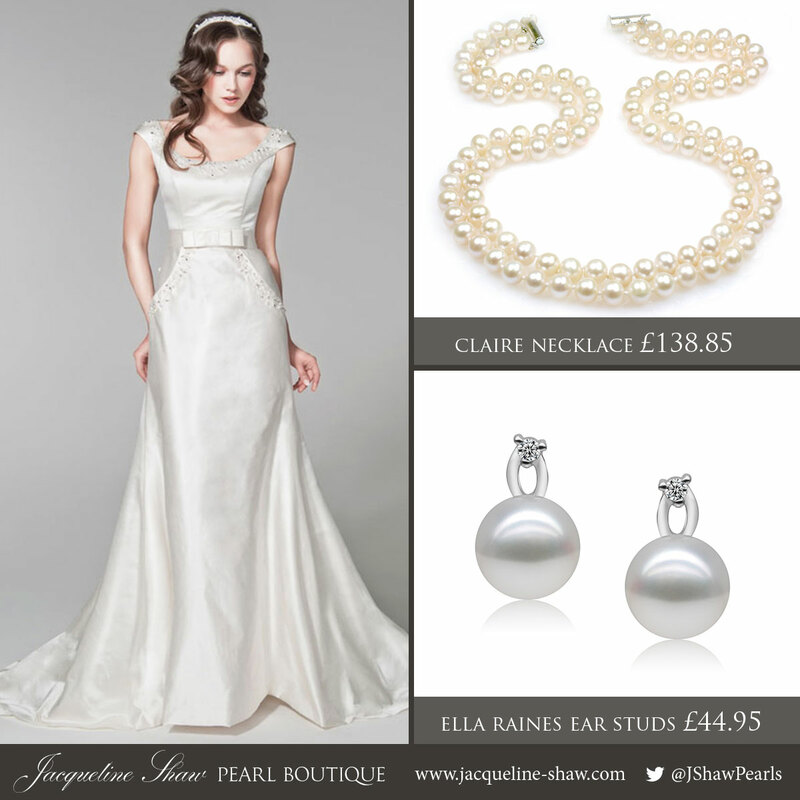 For this elegant low bateau neckline satin wedding dress, we recommend the double strand wedding pearls necklace, the Claire, which compliments the whole style beautifully. Claire is made with the same grade freshwater pearls as in Snow White (AAA) with the same hand-knotting technique that uses metal wire enhancers when connecting strands with the clasp, making the strands last much longer. For ear studs, we pick the dainty lovely Ella Raines pearl studs feature small round freshwater pearls and lovely created diamonds. This Queen Anne wedding dress with lace overlay is a total stunner. 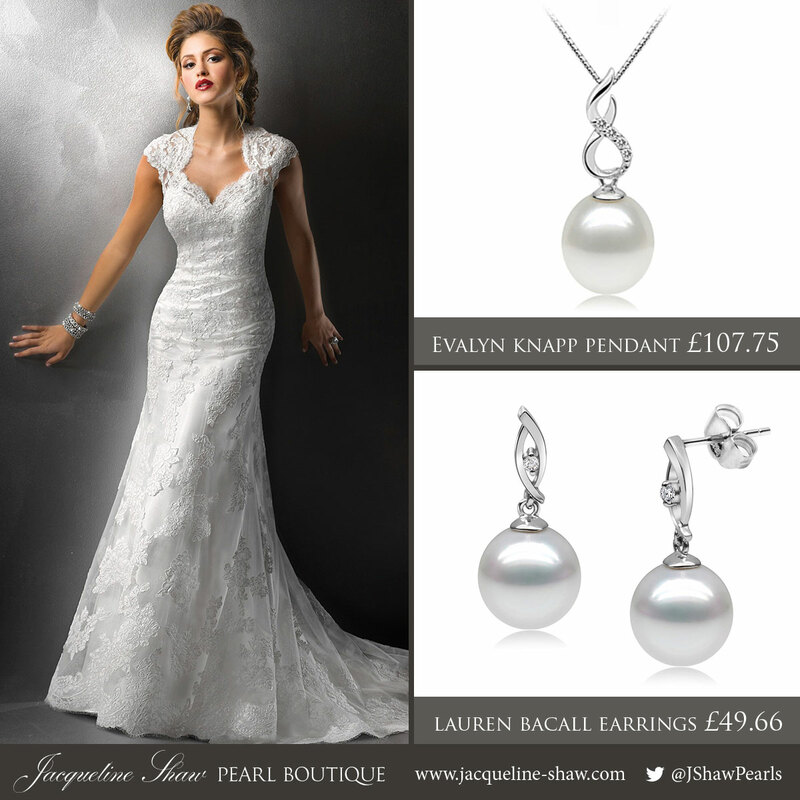 We pick the elegant Evalyn Knapp pearl pendant with the Lauren Bacall earrings for to compliment the look. For bracelet, a single strand Angelina pearl bracelet would go very nicely with the set. For this traditional classic Sweet Heart neckline wedding dress design, we recommend a minimalist single strand pearl necklace made with the top quality pearls (AAA rating), the princess length necklace from our Angelina collection. Finish the look with a pair of Lucy Princess pearl studs that are also rated at AAA, and you have a style that is timelessly elegant. This wedding pearls set can also be worn for other formal occasions such as a gala, and would go beautifully with an evening dress. Drop waist wedding dresses are a great option to show off your hour glass silhouette. They don't have the potential to restrict your walking like a mermaid wedding dress, but still have the similar affect of accenting the waistline. 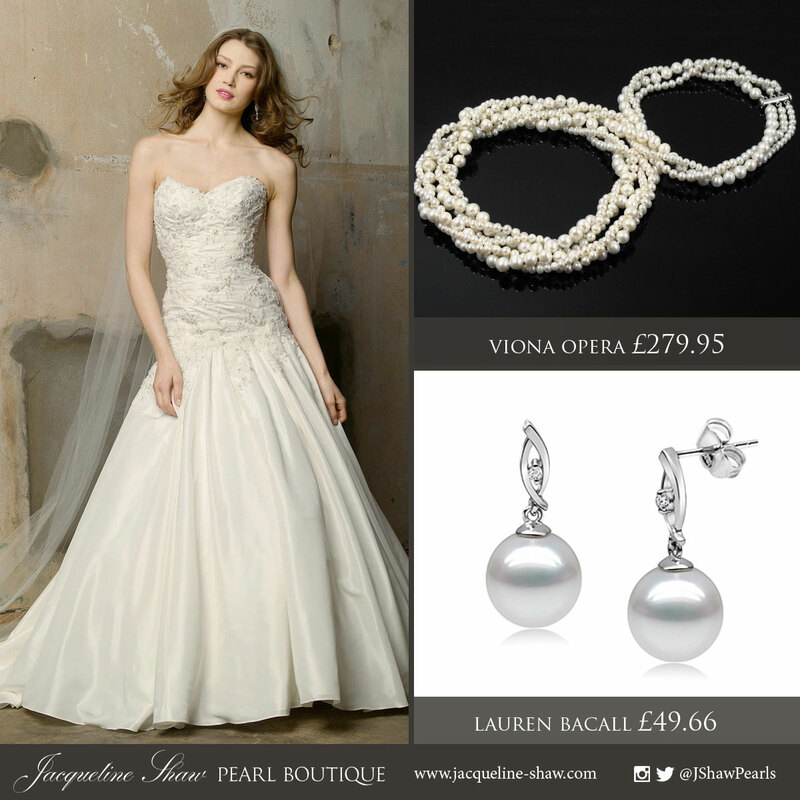 For this lovely jewel encrusted drop waist wedding dress creation, we suggest to go for the long variation of the Viona wedding pearl necklace - the Viona Opera, featuring the exact same pearl strand mix as in Viona, but almost three times as long. At the standard opera length of 24 inches (64cm), the Viona opera can be worn either loose as the three strands of pearls contrast each other; or twisted to create one bigger strand in a braid like fashion. 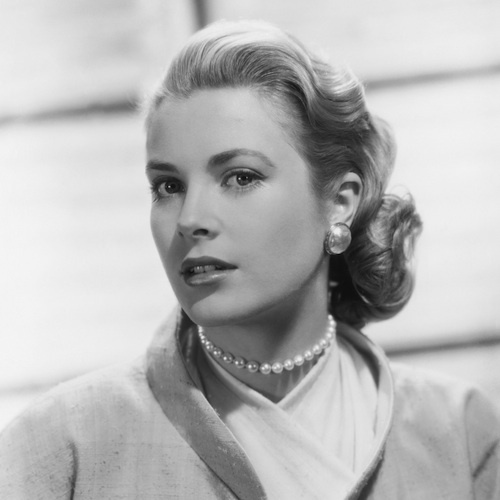 You can also wear this wedding pearls piece twice around your neck, creating a luxurious short six strand pearl necklace that Hollywood actresses like Lauren Bacall have chosen as her signature style. And finally, you might want to do something really different with your wedding. Why not choose a different era with a distinct style as your wedding theme, and make it an event that all the guests will remember and talk about? 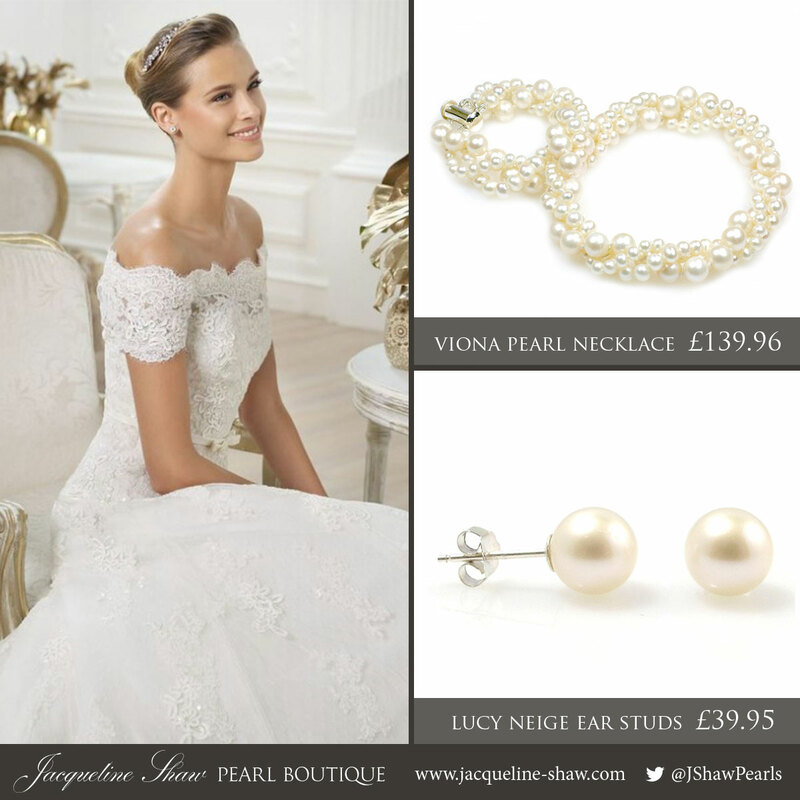 A 1950s themed wedding can be incredibly fun - pick that summery poodle wedding dress and throw on a strand of oversized freshwater pearls necklace accompanied by big pearl earrings. At 10-11mm in diameter, our Doris Day pearl necklace of the slightly oval freshwater pearls with gentle cream overtone is our favourite pick. Complete the look with Lucy Royale pear ear studs - exact same design and quality rating pearls as the classic Lucie Neige, but 1.5mm larger (visually quite a big difference!). Et Voilà! We hope you like these inspirations, and hope you find the perfect pearls for your Big Day!